Mo. 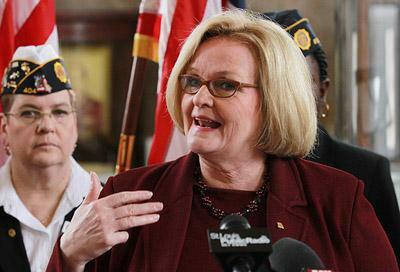 Sen. Claire McCaskill in February 2011. 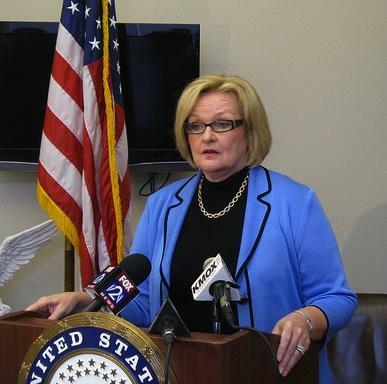 A newspaper's review of travel records has found that U.S Sen. Claire McCaskill spent far less for four years of flights on her private plane than two former Missouri senators spent for travel over similar time spans. McCaskill has been under fire since it was revealed that she spent $88,000 for use of a plane she owns with her husband during her first four years in office. The Democrat says she reimbursed the U.S. Treasury the entire amount to avoid the appearance of a conflict of interest. The Kansas City Star reports former Republican Sen. Kit Bond spent more than $300,000 for chartered planes during a four-year period, while former GOP Sen. Jim Talent billed taxpayers for more than $200,000 for travel. Washington lawmakers often charter planes for speed and convenience. Missouri Senator Claire McCaskill admitted today that she has failed to pay up approximately $287,000 in back taxes on a personal airplane. Problems with McCaskill's plane surfaced several weeks ago amid reports that her office improperly billed the government for travel to a political event. McCaskill took responsibility for that mistake, but she admits that the perception of dodging taxes could hurt her chances for re-election in 2012. U.S. Sen. Claire McCaskill could owe a total of nearly $320,000 in overdue property taxes, interest and penalties on an airplane that has caused her political headaches. McCaskill sent about $287,000 to St. Louis County earlier this week after acknowledging that property taxes had not been paid on a plane owned by a company in which she and her husband have an interest. But that may not be enough money. Republicans are attacking Senator Claire McCaskill for failing to own up to her own rhetoric about openness and accountability. The state Republican Party is calling on McCaskill to release tax records associated with a controversial airplane at the center of a tax and accounting scandal.